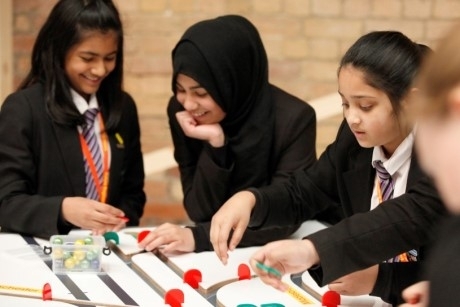 Future Engineers, an events programme that supports the STEM subjects, will return to the National Railway Museum in York for a second time this autumn. The event, which is focussed at Key Stage 2 and 3 students, will run from 21st October until 15th November. The programme is ‘pioneering a new approach to tackling the STEM (Science, Technology, Engineering & Maths) skills gap and aims to spark an interest in engineering that could lead to future careers in railway engineering’. Future Engineers is completely free, involves a number of industry partners, and reached more than 30,000 people last year. It returns this year with a new theme and an expanded programme. What can pupils do at the event? Children visiting Future Engineers will be challenged to discover their hidden engineer and to find out more about how the railways work, with insights into the world of engineering. The programme of educational live shows, interactive activities and events will run for two weeks, with a dedicated week of free school visits (8th – 15th November). Future Engineers will offer a cross-curricular programme of content, with a new theme: Conquering Forces. This looks at how engineers find solutions to create more efficient engines, faster tracks and deeper tunnels. Throughout the public and school’s programmes, new ideas and STEM content will be presented in a hands-on and participatory manner which champions the principles of science capital. There will also be a dedicated session in which STEM Ambassadors and engineers from across the UK answer questions and share what they love about their jobs. Further highlights will include Under Pressure, a new show that looks at the world of tunnels; Engineer Like Me, an interactive gameshow-style session; and Rap Science , a show during which award-winning science presenter, author and edu-rapper Jon Chase will be entertain crowds with his blend of science and hip-hop. Although free of charge, school groups must book in advance. Teachers should visit www.nrm.org.uk/future-engineers to find out more.